Set up your commercial kitchen for all your cooking endeavors with the Atosa ATO-6B 36" Gas Range with (6) Open Burners and (1) 26-1/2" Oven. Built with 6 burners and 1 generously sized oven, this unit can be used to cook multiple foods simultaneously while its stainless steel front, sides, back guard, kick plate and shelf make it exceptionally durable. 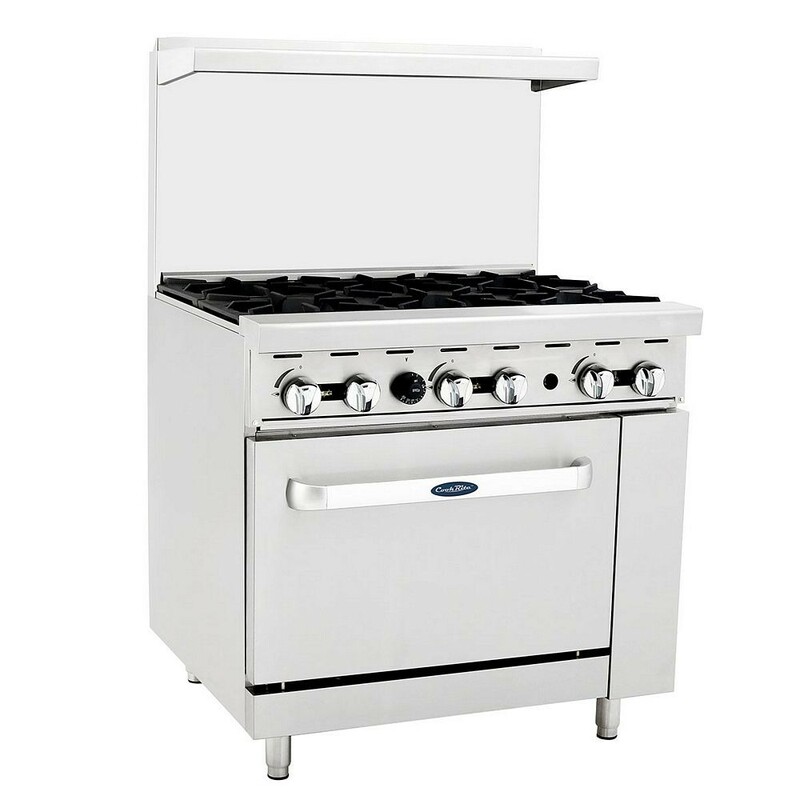 This oven is equipped with stainless steel tubing that is rust and corrosion resistant while its cast iron grates are tough enough to handle high cooking temperatures. In addition, its burners have built-in bowls and troughs to allow excess grease to flow to the right zone while its pilot light offers instant ignition. For added safety, it has a valve that stabilizes the flame in case of emergency while its adjustable feet make it easy to level on uneven surfaces. Hot plate working area: (6 pcs) 11-4/5" x 11-4/5"
Delivered in well protected plywood packaging, by friendly and helpful delivery service. Weight was a little worrisome, but the burners, door, and shelving can be removed easily to reduce moving weight. Once in place, connected the factory supplied regulator to supply line from propane bottle. Worked fine initially and then failed to light. Purchased new commercial regulator, replaced, and worked fine ever since. Only reason not five stars. Supplied regulator a little on cheap side, but at this price who can complain. Have been cooking on same in outdoor kitchen for last 6 months and barely use house kitchen anymore. Be prepared to deal with pilot lights, but so simple it's a non issue. But can this thing cook, and the oven space is awesome. Drip tray below burners makes keeping it clean a breeze. If you are looking for a commercial range that won't break the bank, and looks impressive, look no further. Excellent. Very happy with delivery and product. A: This item is available in 36" and 60" models and can be ordered with either LP or NP gas.